Ideally, baby rattles should be free of lead, phthalates, PVCs, and bisphenol-A. Non-toxic coatings such as water-based inks and vegetable dyes are eco-friendly options for decoration. However, in your quest for the perfect eco-friendly, sustainble, organic, and Fair Trade baby rattle, please don’t forget that one of the most important reasons for buying a rattle is to develop motor skills such as grasping and reaching. If the rattle is eco-perfect but not useful for motor skills because the size or dimensions are not easy for the baby to hold and manipulate, the most important goal will be lost. I encourage parents to have some eco-rattles, but not to fret over mixing in a few plastic ones as well. Keep in mind that the cloth ones cannot be wiped clean, they need to be laundered. This can be a bit labor intensive. Brands such as HABA and VIULLI have made names for themselves by manufacturing and selling only eco-friendly baby toys and rattles. HABA manufactures an entire line of baby rattles and toys, while VIULLI is the maker of the classic baby teether ‘Sophi” the giraffe among others. You can find them online and often at local children’s boutiques. Although the cost is usually higher, a few carefully selected rattles last a long time. 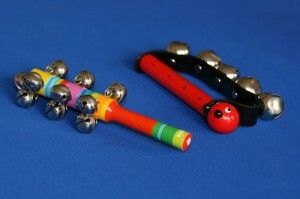 Larger rattles require more movement of the arms and hands from baby. Previously, we discussed the importance of smaller rattles for babies from birth to three months. The rattles need to be small enough so their little hands can hold them, and light enough that they can shake them. As baby grows, she can eventually handle these larger rattles. Usually by around seven months of age these larger rattles are well manipulated, as the baby in the above photo demonstrates. They are excellent for her motor skill development since they require much more use of the arms and hand-eye coordination. In today’s nursery, the toy selection often includes an abundance of electronic toys. Although the fun sounds and twinkling lights may provide a long stretch of entertainment, it is important to be mindful of motor skill development. Pushing buttons with fingers does not develop the muscles of the arms or the hand-eye coordination nearly as much as shaking a large rattle with bells. 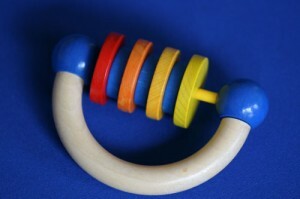 To make a sound with a rattle, baby has to physically pick it up and move it several inches up and down or side to side. When baby stops moving, the sound of the rattle stops as well. Although some variety with both electronic and non-electronic toys may be ideal for some parents, it is important to keep baby’s motor skill development advancing with the manually operated toys: simple rattles. This rattle is quite simple in its design, yet it is the most coveted toy in my studio. The reason, I would like to suggest, is that it stimulates multiple senses: hearing, touch, and sight. In previous posts we discussed the importance of a rattle that makes sound clearly and easily. 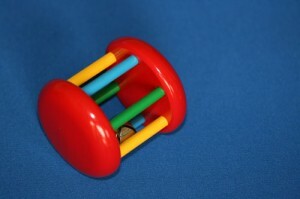 This rattle not only makes a very clear and distinct sound, but the cage design allows baby to see the bell move. This stimulates both hearing and sight. Touch is stimulated because the cage bars are very thin in diameter, making it easy to hold and easy to shake and produce the sound. Baby is also able to stick part of a finger in between the bars and attempt to touch the bell. She can hear the bell, see the bell, and touch the bell. This is very interesting for her and she learns a lot from this process of exploration. This rattle is wonderful to introduce for baby play when she is about 3 or 4 months old. 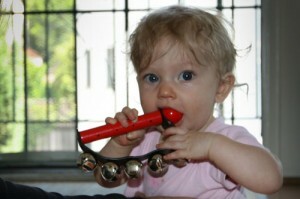 It is more complex than the rattles recommended for newborns, and yet it is small enough for her to easily manipulate. The design is closed at both ends so there is no danger of poking with a pointy rattle tip. The lightweight plastic material makes it light enough to make it easy for her to shake and create a magical sound. 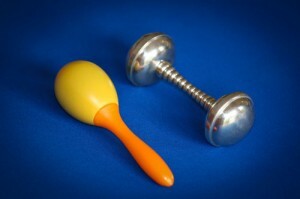 It is necessary, however, to watch the point on the one end of the maraca. Use should be supervised. This rattle design is often sold in sterling silver or pewter, giving the rattle a bit more weight. It is also available in wood variations as well as plastic, however baby develops more strength from the silver or pewter material. This rattle is best introduced after some time with a lighter weight rattle. Otherwise, it is too heavy for her to play with. The diameter of the stick handle is still small enough for her tiny hand to grasp and shake it. Another virtue of this classic design are the rounded ends, as baby now avoids the potential hazard of the pointy end of the maraca-style. 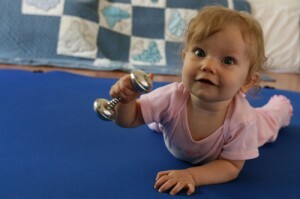 Baby benefits tremendously from playing with a rattle in her early months. 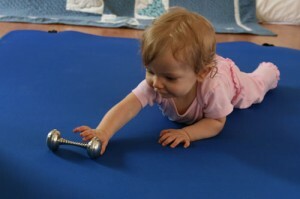 The skills learned are both fine and gross motor skills as baby learns to both grasp the rattle with her hand and fingers (small muscles=fine motor) as well as shake it with her entire arm (large muscles=gross motor). The feeling of holding the firm material of the stick handle in the palm of the hand develops proprioception. The interesting sounds facilitate the hand-eye coordination since it gives baby an obvious clue as to where in space the rattle is. Baby learns to match the proprioceptive feeling with the sounds she hears. These two styles of rattles, purchased together, make a unique baby shower gift. I guarantee you that no one else thought to pick out something for the earliest days of rattle play. For a more elaborate gift, choose an additional two or three rattles of larger size and with thicker handles for when baby is a bit older. Try to select a variety of weights and sounds for your gift.